Mozella Mitchell is Professor and Chair (as of August 7, 2006) of Religious Studies. She received her B.A. degree in English from LeMoyne College, Memphis, in 1959; an M.A. in English from the University of Michigan in 1963, an M.A. in Religious Studies from Colgate Rochester Divinity School in 1973, and a Ph.D. from Emory University in Literature and Theology in 1980. 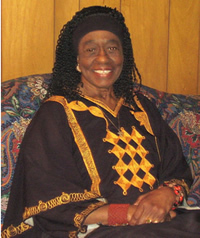 Her primary areas of research, teaching, and publication are Literature and Theology, African American Religious History, African and Afro-Caribbean Religions, Issues in Caribbean Religions, Comparative Mysticism, Women and Religion, New Testament Theology, Contemporary Religious Thought, Liberation Theologies, African American Religious Thinkers, Malcolm X and Martin Luther King, Jr.; and Religion, Culture, and Social Development. Dr. Mitchell is the author of Spiritual Dynamics of Howard Thurman’s Theology (1985); editor of Howard Thurman and the Quest for Freedom: Proceedings of the Second Annual Howard Thurman Convocation (Peter Lang Pub. Co., Inc., 1991); New Africa in America: The Blending of African and American Religious and Social Traditions Among Black People in Meridian, Miss., and Surrounding Counties (Peter Lang, 1993); Crucial Issues in Caribbean Religions (in press, Peter Lang, 2006). She has published numerous articles and essays in journals and edited collections. She is the General Editor of the Martin Luther King, Jr., Memorial Studies in Religion, Culture, and Social Development series for Peter Lang Publishers (New York and Switzerland).